Home > Ask Our Experts > All E Numbers Bad For You? Are all E Numbers bad for children? It's just that my little boy sometimes has a really bad day at school and we're trying to find out if it's an E number that's causing it. So far the linking factor is frozen croissants which have the following e numbers (E472e, E300 & E160a), would any of these affect his mood? Thanks for your question. It must be very frustrating trying to find the cause of your son’s bad days at school and it’s very possible that an E number may be at the heart of the problem. To answer your first question, “Are all E numbers bad for children?” well, no, they’re not. E numbers generally get a lot of bad press, as people assume they’re all synthetic additives which can cause side-effects for children and adults. Whilst that’s certainly the case with some E numbers – and some more than others are known to cause problems – not all E numbers stem from synthetic or manmade origins and can be from natural sources too (interestingly, one of the E numbers you’ve pinpointed does come from a natural source). The difficulty for parents is of course knowing which are bad and which are less harmful, especially when manufacturers don’t always make it easy for consumers to find out what’s in their products. It’s useful that you’ve managed to pinpoint a few E numbers that may be affecting your son. 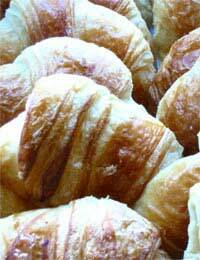 E472e is commonly used in croissants and other bakery products, as it acts as a dough conditioner, but it can also crop up in other products, such as gravy granules, hot chocolate and frozen pizza. It originates from tartaric acid (E334) and the esters of glycerol (E422). Generally speaking, it’s not one of the E numbers that is renowned for causing problems, although it is always possible, so this might not be the main culprit. E300 is ascorbic acid or vitamin C and is one of the few E numbers that actually stems from natural sources. It’s used in products due to its antioxidant properties – it works in a similar way to preservatives and helps products stay fresh, last longer on the shelf and improve the look and taste of foods. It’s possible that a child could react to ascorbic acid, but it’s not one of the common E numbers that causes reactions when consumed in small doses, and not really with regards to behaviour. As far as E160 goes, it’s a colour – and colours are often the source of some children’s behaviour issues. E160 is categorised from E160a to E160f, each with slight variations on the same ingredient. All of them, however, are used to add an orange, yellow or red colour to products. Originally, the primary source for E160 would have been natural, as the beta-carotene would have been gained from natural sources such as carrots or tomatoes; now, however, it is largely manufactured. There aren’t major side-effects that have been noted to be linked to E160, although E160d has been banned in Australia and E160c is also avoided in several countries. Studies have found other colours are linked to hyperactivity and changes in children’s behaviour, so this may well be the source of your son’s problems. tell me detail aboutE631 sources etcand please I need the list and photos of those food's that use E631.Thanks for this may God bless you always. am very interested with E631 tell me more about this and please I need photos of those food's that use E631 Thanks for this may God bless you always.